I love classic dresses that are not only beautiful to wear but also comfortable. This dress has been one that I have constantly been reaching for in my closet lately, whether it be for trips to the supermarket, walks in the park with the dogs or bike rides! Rock N Romance has a huge range of Seamstress of Bloomsbury clothing, various other brands and also a new line of their own. This has to be one of my favourite dresses by this particular brand so far. 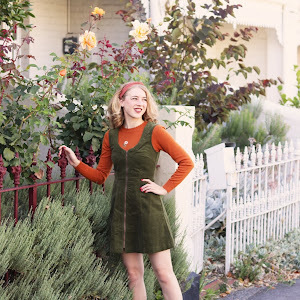 The Nessie dress is made to have a slightly loose fit but with the tie and design this dress has a really nice silhouette and you are able to cinch in your waist. I love front pockets and my phone + coin purse keeps ending up in these ones! I also love the rayon fabric that is used for a lot of the designs by Seamstress of Bloomsbury, including this one. 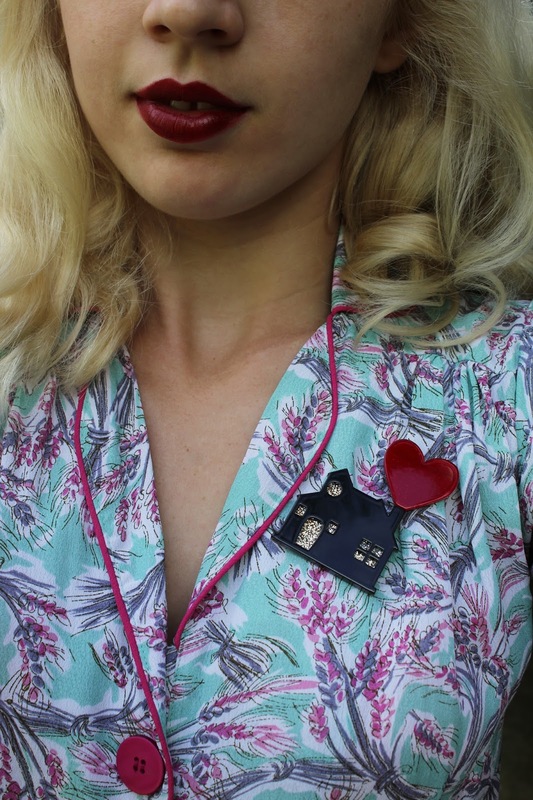 I paired it with my Erstwilder brooch which is so sweet and stands out really well on a lot of my outfits. There are plenty of things to like about this dress but the colours were what caught my eye at first. I am wearing size 8 again for this brand and have found this style to be one of my favourite fits - though if you are worried Rock N Romance has really great advice when it comes to sizing so be sure to ask! I like to alternate by doing my serious bike rides which involve the hills in the area in my sportswear (which I like wearing, I have lots of coordinated sets) and if it is a laid back bike ride then I can pop something a bit glamorous on to go with the bike! Sometimes you have to get the photos first before stuffing your hair into a bike helmet too, haha! These photos are so beautiful! 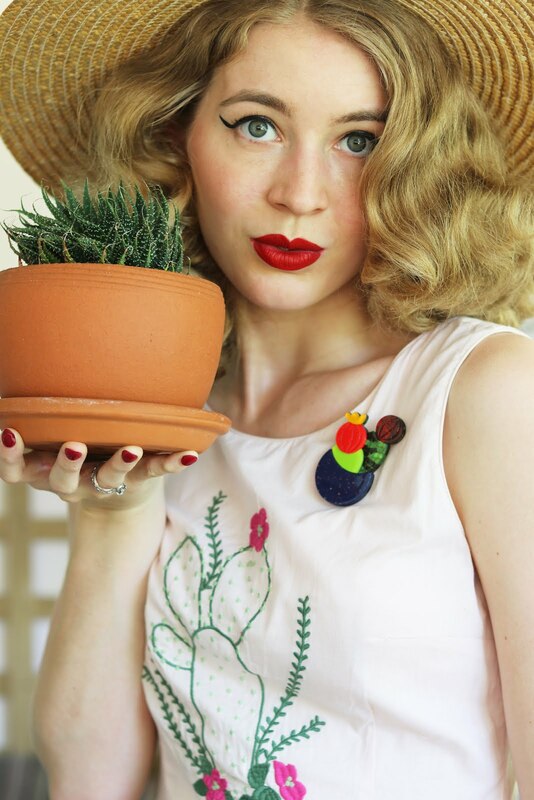 I am in love with your style (and blog of course!). Fabulously pretty outfit! 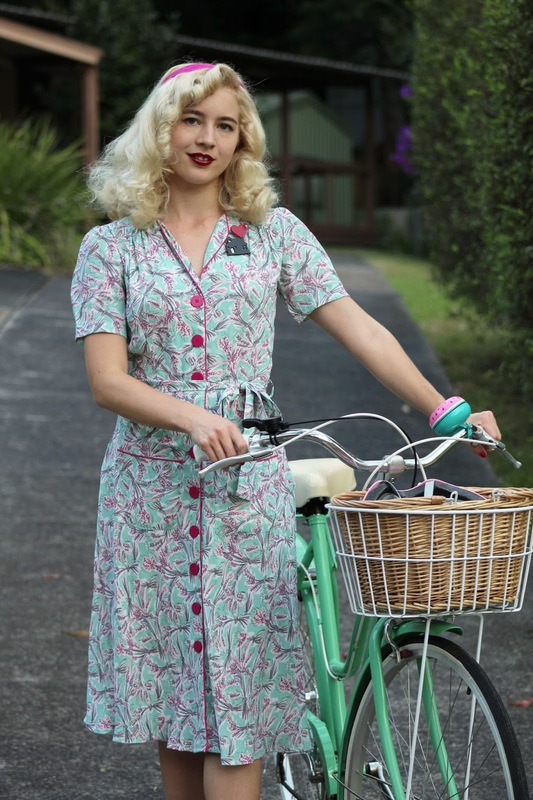 I can't express enough how much I adore that your frock and bike match. Talk about an awesome - and highly functional - "accessory" for this beautiful Nessie frock. Your dress and shoes are super cute. What a gorgeous and classic style of dress! I definitely have to check out this brand. I can't wait for the warm weather to hit as I love bike rides in the summer! I love the bike, what a dream! I have to say that dress looks like real vintage! hello there,nice photos and great look...cheers! Such a lovely dress! You look stunning, Kayla. Its great to have a dress that can be worn casually for anywhere you need to go. I have a couple that I always seem to reach for and they are a godsend! Gorgeous dress! Such a great print and it looks so cute with your bike!